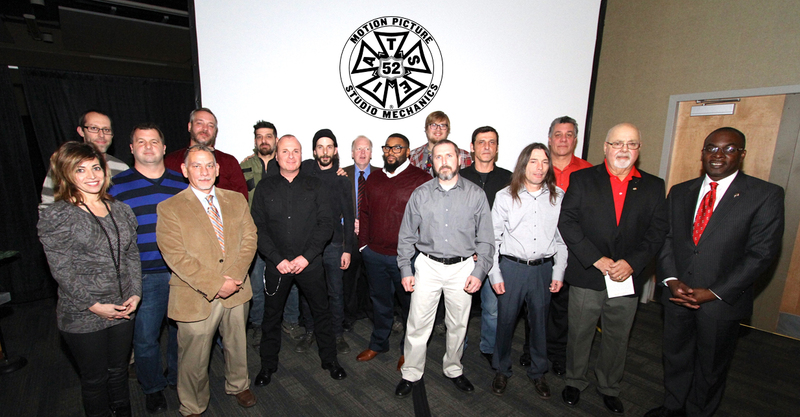 (January 17th, 2017) The Western New York Region of the International Alliance of Theatrical Stage Employees Union (#52) Studio Mechanics celebrated the holidays by inducting another 17 experienced members into it’s local crew base. Regional Representative John Scardino administered the oath to the new members on behalf of IATSE 52 President John Ford. A tireless advocate for film production in Western New York, Buffalo Mayor Byron Brown was on hand to congratulate the new members along with Film Commissioner Tim Clark. This crew addition will go along way in increasing the the ability of Western New York to attract larger films to the region. It will also make it more affordable for productions by making use of our well seasoned local crew base without having to import union crew members from elsewhere. PHOTO (L-R) – Daniela Cosmano-Kayser, Matt Nardone, Mike Amato, Bob Ross, Frank Coppola, Rick Liberatore, Matt Quinn, Film Commissioner Tim Clark, Kash Costner, Chris Brown, Chris Rados, Tom Rukavina, Jim Kerr, Rich Battaglia, Regional representative John Scardino, and Buffalo Mayor Byron Brown.